December 21, 2015 By Ethan Johns & filed under All Articles, Handguns, Weapons. When two companies with the reputations of Bravo Company and Wilson Combat announce they are going to collaborate on a limited edition, it’s worth paying attention. The BCM Gunfighter 1911 is a steel hand-fitted full-size Government model with a light rail and a laundry list of special features that set it apart. It is flashy in its almost conspicuously subdued blackness, with a matte black Armor Tuff finish and black Micarta grip panels. This is a nod to its hard use intention, fit for duty anywhere a full-size .45 is appropriate, while downplaying its full-house Wilson Combat custom provenance. Bravo Company Mfg. 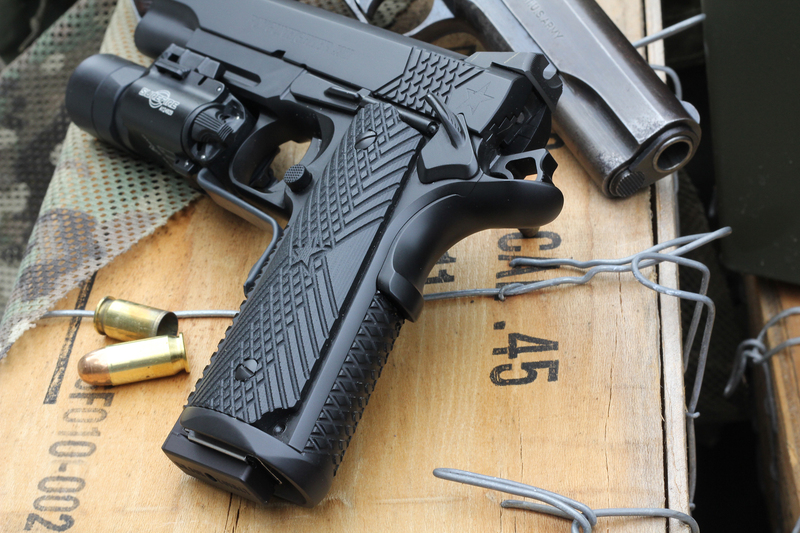 and Wilson Combat teamed up to bring the limited-edition BCM Gunfighter 1911—a hand-built interpretation of a professional-grade .45. Copperhead not included. The Gunfighter’s blackness may be the first thing that grabs the eye, but the blend of features is right behind. 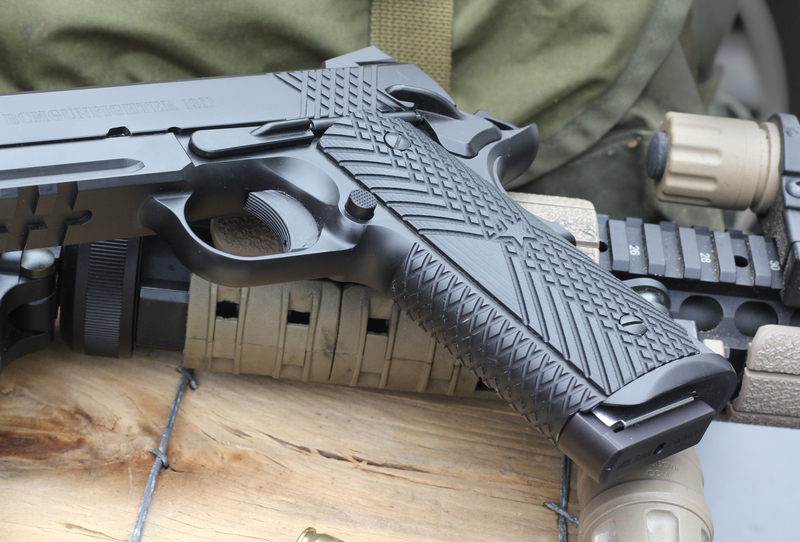 Wilson’s proprietary X-TAC checkering is used on the slide, front strap, and mainspring housing, setting the pistol off with a unique edge. The sights are a tritium front paired with a plain serrated Battlesight rear that has a U notch, plenty of light through the notch, and no distractions. The Gunfighter is available with single or ambidextrous thumb safeties per the customer’s preference, and Number 5 tested here wears a single sided. Hallmark feature of Gunfighter 1911 is its smooth cycling, a testament to over 30 hours of hand fitting. The magazine release is ever so slightly extended, allowing many to drop the mag without the habitual grip shift of many 1911s but with no risk of an inadvertent “oopsie” magazine release. All parts are Wilson Bullet Proof, which many ‘smiths consider the standard for durable machined steel upgrades on lesser pistols. The solid trigger breaks like you dream about, at three pounds and change. There is just enough pre-travel to let a gloved finger know it is at the wall and then a release that leaves the shooter with every opportunity for success—it is “pass it around to the buddies ‘feel that! ?’ ” good. The recoil system is traditional without any goofy guide rods, and the front end locks via the bushing system. The bushing was a precise fit that was impressive on its own with absolutely zero play, but still able to be removed or installed by hand. For me, the standout feature in handling the BCM Gunfighter is the silky smoothness with which it locks and unlocks. The Browning link system can very typically have two slight to pronounced “bumps” by hand or recoil as it cycles: one as recoil causes the slide to “knock” the locking lugs on the barrel backwards and down, and another as the recoil spring drives the feeding and chambering as the lugs “clunk” back into lock up. The unlocking and locking are almost imperceptible in Number 5. It feels like a fixed barrel that isn’t moving. The slide glides back and forth on the rails with no friction and zero play. What surprised me was, when the pistol was apart for inspection and lubrication, the fit was actually tight—tipping the slide on the frame without the barrel did nothing. One might expect from the silky travel that the two would mate together and smoothly race just with gravity, but the tolerances are impressive. Disassembled, the shooter can see just how tightly the pistol is fitted, but together and ready for work, the pistol transforms into a testament to proper hand fitting, with uncanny smoothness. I’ve been issued a good number of hand-fitted national match and duty 1911s, even getting “pick of the litter” in the armory on several occasions. I’ve also had the good fortune to shoot a healthy number of custom 1911s from other units and makers. BCM 1911’s exceptional trigger, bold Battlesights, and handling qualities translated to the target as in this 99 on the Ten-Shot Assault, and possibles for two strings of five shots in five seconds at ten yards. When I say that Number 5 is smooth, it comes with plenty of legitimate comparisons to bounce it against. Over 30 hours of handwork goes into each build. It’s worth rewinding and visualizing that. There’s a reason a true custom 1911 feels different, and then there’s an additional difference between handwork by a routine smith and a shop like Wilson that is at the top of their game. That smoothness was the hallmark of every shooting session with the Gunfighter. The recoil cycle benefited from the effortless gliding of the action, while the other features kept the 1911 anchored in hand. The Gunfighter shoots just a touch softer than you might expect with hardball or +P JHPs, subjective in feel, but substantiated on the timer. Shooting it with Winchester 3-Gun 230-grain flat points or Wilson Combat match 200-grain lead semiwadcutters causes the shooter to forget he is still launching major power factor .45 goodness downrange. When a light is mounted to the rail, this effect is accentuated, the additional weight helping tame recoil further. Wilson Combat Bullet Proof X-TAC mag well added to feel of the pistol and boosted reloads, as did gently extended mag release. 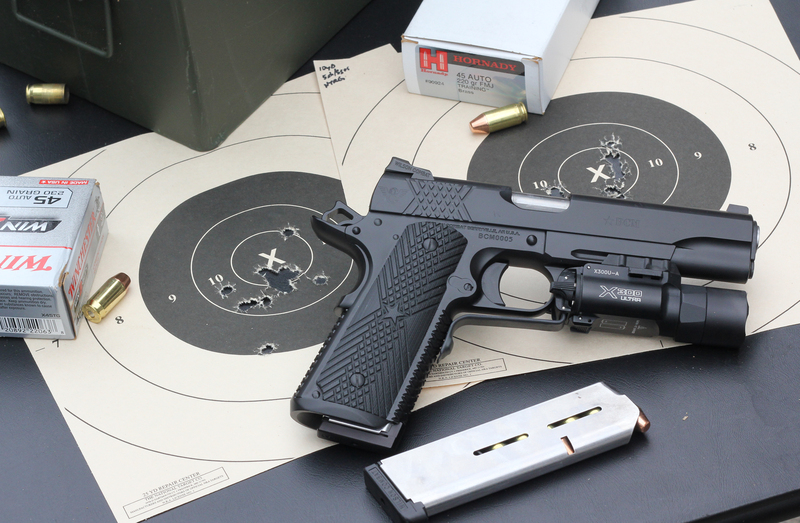 Wilson Combat builds the Gunfighter with a one-inch guarantee at 25 yards. That is a tall order that speaks to the confidence they have in the gun. However, Number 5 delivered with Wilson’s 200-grain HAP JHP load. I put down a couple of groups that were right at the one-inch mark from the bench, with four of the best group’s holes in .88 inch. Another standout load was Hornady’s 220-grain Training flat points, with boringly consistent 1.25- to 1.6-inch groups from bench, barricade and slow fire. A roundup of 11 loads clustered their groups right on top of the front sight at an average of 1.53 inches. I noted an unusual consistency in point of impact among makers, bullet weights, and loads. Across the loads, there was very little shift in point of impact at 25 yards. This is unusual in my hands, with many of the pistols I’ve worked with lately having the expected shift between grain weights, and some guns having a few inches shift with different types or makers of the same weight. The BCM .45 was noteworthy and so consistent in this regard that at this point I would almost expect any in-spec load to cut the same hole. All good, but accuracy at the bench is at the kiddie table compared to what the pistol lets you hit on demand. The Gunfighter earned its keep on all drills. Probably not a surprise at this point in the story. Mud tire appearance of X-TAC checkering is appropriate, as it adds serious traction with no discomfort. The best example is the Ten-Shot Assault (TEN-SHOT QUAL COURSE: Budget Shooting Performance Test, January 2014 S.W.A.T. ), with multiple shots on the clock at 25, 15, and 7 yards, finishing on the move. 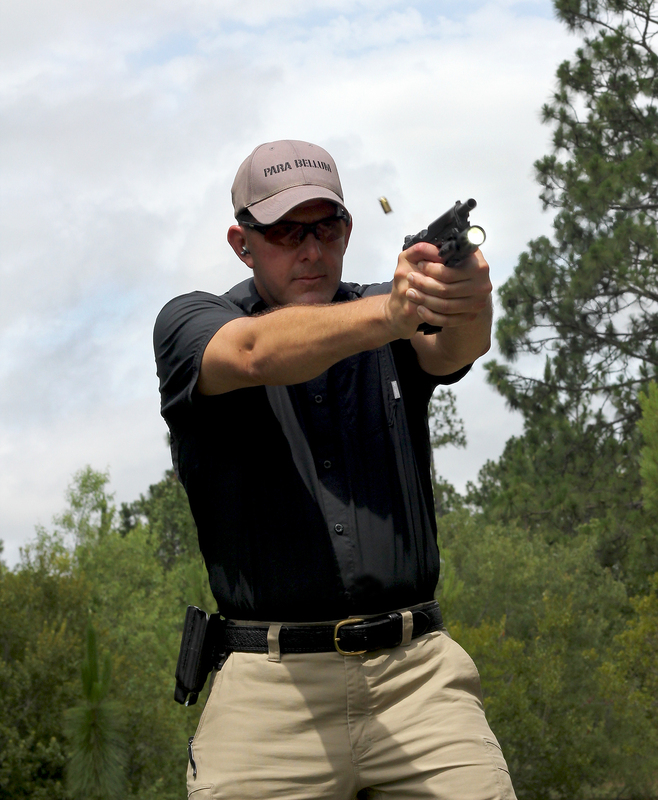 The drill can be run for bests with respect to time or score as long as the shooter doesn’t exceed 20 seconds or too few points. I ran for score, which for me often results in a slow time with no more points than when I hoof it. But Number 5 posted consecutive runs of 98 and 99 with the Winchester 3-Gun loads in 19 and 18 seconds respectively. A 100 would certainly be better, but 99 is a personal best at the moment. Running strings of five shots from the ready in five seconds at ten yards on a B8 target yielded easy 100s, with most in the X and time to spare. The 1911 gobbled up steel plates as fast as I could put the front sight on them, besting my usual 1911 times on the plate rack. 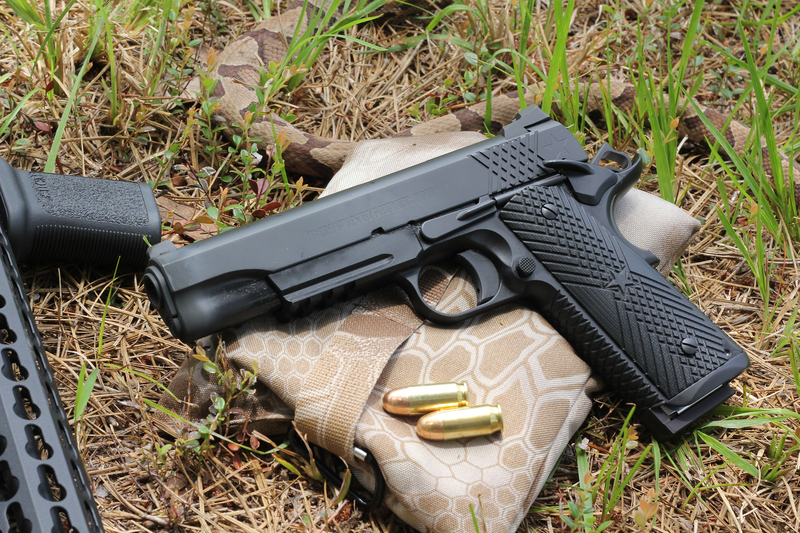 This is one of those handguns that allows you to deliver exactly what you are capable of with no excuses. Ledge shape of Wilson Bullet Proof slide release helps operation compared to typical 1911 releases, and is a machined and hardened part to go the distance. The X-TAC checkering and BCM grips worked extremely well. The pistol was locked in place as good as with any other traction approach I’ve used and better than most. What was particularly good about each was that the traction doesn’t commit the shooter to that location, allowing the hand to stick with pressure or adjust easily when desired. Equally appreciated was that the X-TAC didn’t abrade, poke or otherwise end up causing pain by the end of a long training session and shouldn’t require gloves or the shooter to “earn” calluses. The X-TAC has a distinctive “mud tire” look that either seems cool or is off-putting depending on taste, but it works—and works extremely well. It is matched on the slide’s grasping grooves and there for me it worked, but was perhaps not much more effective than the traditional vertical serrations going back to the original M1911. Two component pieces that also add to the overall pistol are the Bullet Proof slide release and X-TAC integrated magazine well/mainspring housing. The slide release has a different shape than much of what is on the market, subtle but effective. The original Colt part had a pronounced concave curve and sharp checkering and was very effective. Over the years it seems that the part has slowly morphed on many guns into a lightly grooved, sloped part that is hard to get purchase on at speed to release the slide. This is accentuated with gloves or sweaty, smaller or weaker hands. The Wilson release addresses this by removing the slope and providing the shooter a perpendicular ledge that doesn’t extend any farther, but works like a champ. The Bullet Proof mag well is masterfully blended and gives a very generous opening to get the single-stack magazines in. Reloading is comparatively much more important to 1911 shooters than their 18+ shot 9mm armed brethren. Between the mag well and slide release, the Gunfighter makes that substantially easier and more certain. The current market saturation of 1911s of every type and price has probably skewed perceptions of what is reliable and possible in the design. 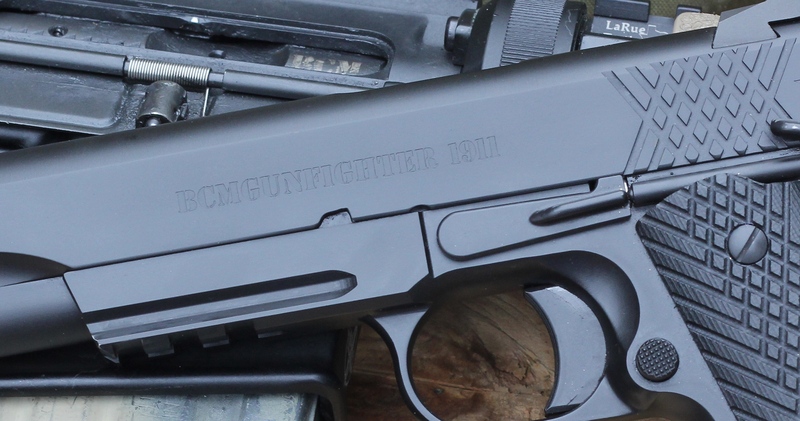 In the gun’s first 900 rounds, the Gunfighter had one hiccup with quality magazines. This was a failure to go completely into battery with a MagTech 230-grain jacketed semiwadcutter target load. This resolved quickly at “Tap” of the immediate action cycle. A pretty small outlier: target loads in the traditional 185- and 200-grain weights cycled like a champ, as did 150 other rounds of the MagTech and all duty load profiles. With two highly reputable companies standing behind a signature gun that bears both logos, the shooter is the winner, getting a unique blend of features that work extremely well and are not available from Wilson Combat as a standard item. A custom hand-fitted 1911 is an anomaly in a largely disposable oriented society. Cycling the Gunfighter, it is immediately apparent that it is different. The more you’ve handled 1911s, the more obvious that feeling equals days’ worth of hours in talented hands to make it right. The price reflects this and will be the elephant in the room for some. Each individual has a scale of worth and value that is unique to them. The Gunfighter isn’t meant to compete with the average pistol. It is better viewed as a concept of what is possible in a combat .45 when the time is taken to make it as smooth, reliable, and accurate as it can be all at the same time. This will have a powerful appeal to some. I hope the best names in our industry continue to collaborate like this.